The Poppy design from the Symbolic Flowers Post & Go set will be re-introduced nationwide from 19 October 2015. The stamps will be available from Post & Go /Self-Service Kiosk post offices, BPMA, Royal Navy Museum and Royal Mail Enquiry office machines." It will also be one of the options at the Sindelfingen and Paris stamp exhibitions - see here. UPDATE: The Poppy stamp has been reprinted with MA15 year code: there are reports of blank examples already being offered on auction site eBay. From 19 October, printings at the four Royal Navy sites will be updated to replace the current museum abbreviations. The Poppy stamp will be reintroduced from 19 October to 15 November, and the Machin will replace the Poppy on 16 November (But see below). The Union Flag stamp will remain on sale. The Union Flag and Poppy stamps will just have the abbreviations replaced. 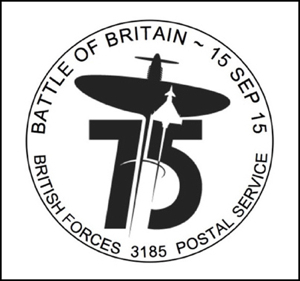 A location-specific logo graphic will be added to the Machin stamp design: the first day of use of this at the Royal Navy Museum will be 16 November, and at the other three 18th November (see below). Royal Navy and Royal Marines machines only will carry a ‘Trafalgar Day’ inscription on the Union Flag design from 19 October until 15 November. Only the Royal Navy Museum is open on 16th November. The other three museums are on winter opening times (closed Mon & Tues) and therefore the first day for Machin will be Wed 18th Nov.
Machine A001 introduced the Lion design from the Heraldic Beasts issue on 16 September. The Lion design will be temporarily replaced by the Poppy stamp from 19 October until 15 November. 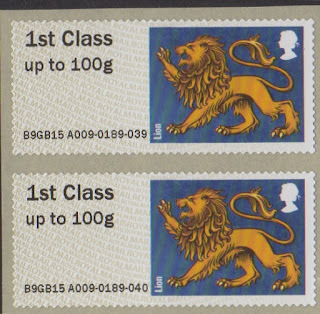 The Lion will be re-introduced along with the Winter Fur and Feathers stamps on 16 November. The change to the Royal Navy Museum machines will be welcomed if only because it avoids having to explain what the various abbreviations mean. Watch out for switched reels so that the Union Flag stamps have the logo! Royal Mail will attend the Sindelfingen exhibition on 29-31 October 2015. Machines A007 and A009 will carry Union Flag, Machin and Lion, Poppy respectively. European Collector strips of four stamps (1st Class, Euro 20g/World 10g, Europe 100g and Worldwide 20g) will be introduced for the first time. Royal Mail will be attending the Salon de philatelique d’automne in Paris on 5-8 November 2015. 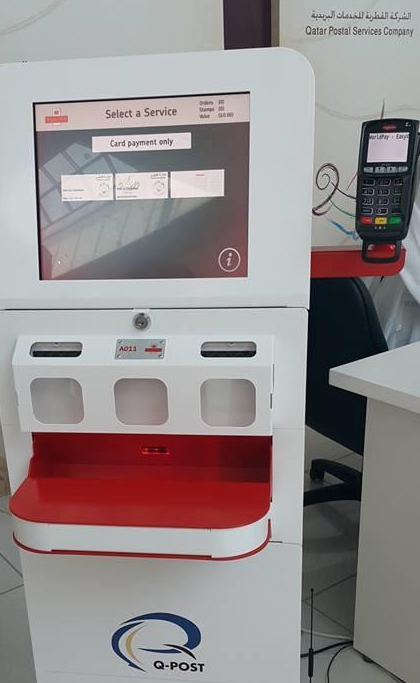 A new Royal Mail Post and Go Kiosk (A011) was in use at the 20th GCC Stamps Exhibition in Doha, Qatar, are 29 September to 3 October (at the Landmark Shopping Mall). The event is organised by Qatar Postal Services (Q-Post), in cooperation with Qatar Club for Amateurs of Collecting Stamps and Coins, with participation of all GCC states and a large number of GCC amateur associations for collecting stamps. The exhibition includes more than 200 frames, 25 of which are allocated for GCC states, to showcase their best collections of stamps and history to share experiences and support amateur groups. The annual expo is held alternately on the sidelines of meetings of GCC postal corporations directors. Qatar Philatelic and Numismatic Club will hold an auction of stamps and coins on the third day of the exhibition. I'm told that the machine dispensed Q-Post stamps printed by Cartor. More details and pictures on the Commonwealth Stamps blog here. 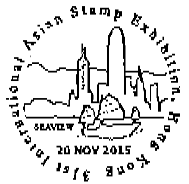 Royal Mail have announced their attendance at the 31st Asian International Stamp Exhibition in Hong Kong from 20 - 23 November 2015 at the Hong Kong Convention and Exhibition Centre. 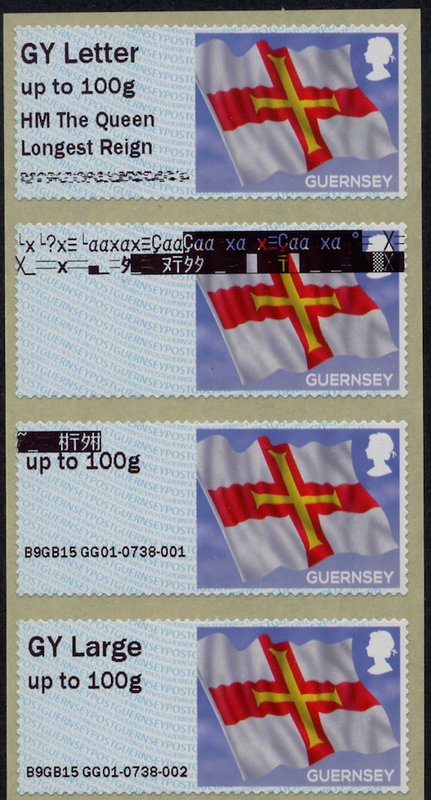 Gibraltar machine GI04 (a new machine) will also attend, carrying Gibraltar Flag stamps. I'm told that the Gibraltar machine did not go to Hong Kong. Royal Mail's reference number is 13685 and this can be obtained from the London Special Handstamp Centre at Mount Pleasant. Looking at the international stamp exhibition schedule in conjunction with the Sea Travel Faststamps, there is also New York 2016, so it seems quite likely that the New York Manhattan Skyline stamp from this set will also appear as a single-roll offering if Royal Mail take their Post and Go machines to the USA next May. Stampex Post and Go News and other things! Autumn Stampex seemed to be a quieter event than usual, possibly because we had already had two events at the Business Design Centre this year. Royal Mail released the new Sea Travel Post and Go faststamps on Wednesday (day 1) but visitors on Wednesday found that once again all was not smooth sailing with the machines. 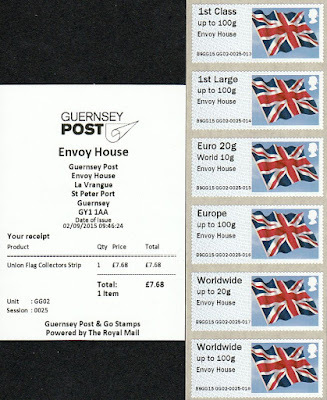 I haven't heard of any problems with Royal Mail's output but the Jersey and Guernsey (and Gibraltar?) machines were not operational until the middle of the afternoon on day 1 due to card machine problems, and then the meagre supplies of Jersey stamps were exhausted before the end of the day! The set of 6 Sea Travel stamps were as expected. 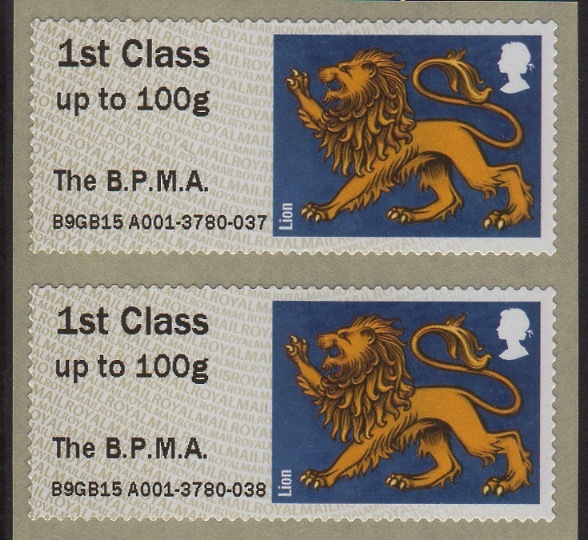 The BPMA had announced some months ago that the machine in their foyer would be loading a single-design Lion Heraldic Beast roll (with added BPMA inscription) on 16 September, and in just before Stampex it was confirmed that this would also be available at Stampex, with no extra inscription. Nobody has explained why this roll was produced, nor whether any other Beasts will appear as single-design rolls - maybe the Dragon for PO branches in Wales (or maybe a Welsh museum?). Vince Patel reports a glitch on the first purchase from the Guernsey machine, which produced 8 stamps, only one of which had the correct Longest Reign inscription as shown (left). I noticed on eBay a similar error from Jersey Broad Street (right). 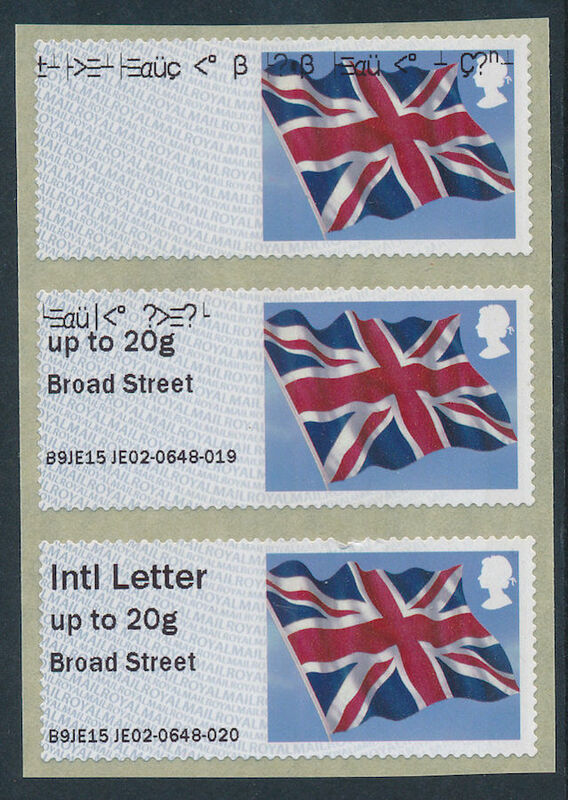 Local Standard, UK 20g and 40g letters, EU 20g letter, Worldwide 20g letter and Registered Fee. Spain up to 50g and 100g, EU 20g and 30g Letter, and Worldwide 10g and 20g letters. RGPO's postage rates to the UK are 64p for 20g and 12p for each additional 10g; EU & Worldwide rates have a similar pattern but letters to Spain are for 50g, 100g, 500g and so on. An odd arrangement but at least the stamps do match postage rates. 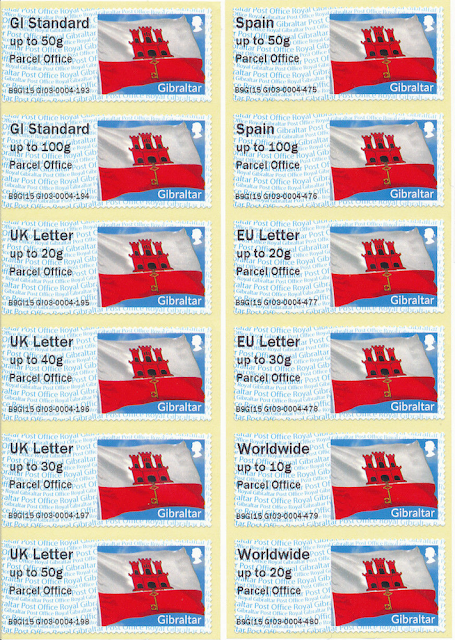 Were there 12 Gibraltar stamps at Stampex? I don't know: I used the menu to select the Collectors Strip and I don't know whether a second Collectors Strip was available. It never occurred to me to look! All I know is that there are at least 14 stamp values, without looking at variants of additional inscriptions. Additional images here, including the receipts from Gibraltar Parcel Office showing W Collectors Strip and L Collectors Strip, courtesy of Thomas von Loeper whose eBay listing can be found here. UNDP Global Goals marked by another new slogan postmark. On 25th September 2015 at the United Nations, 193 world leaders will adopt the Global Goals, a series of 17 ambitious goals to end poverty, fight inequality and injustice and tackle climate change for everyone by 2030. Royal Mail has designed a special postmark, featuring the Global Goals logo, which will be applied to all stamped mail in the UK from 25th September to 2nd October. The postmark reads: The Global Goals For Sustainable Development. The Global Goals message will be pushed heavily on 26th September by major brands including all major mobile phone companies. Here in the UK the Global Goals logo will replace the Standard Chartered logo on Liverpool FC shirts at the fixture against Aston Villa. New Format Horizon Label fatures 2D bar-code and much more detail. The new format Horizon labels, first used at Europhilex and trialled at a number of offices since, were distributed last week and went into first use, as expected, on 21 September. An earlier report had suggested that the change in format of the counter printing would start in mid-October, but it seems that the print details are being changed now and are already in use. The new printing has a number of differences to the old, but we don't yet know how many of these will apply to all labels. 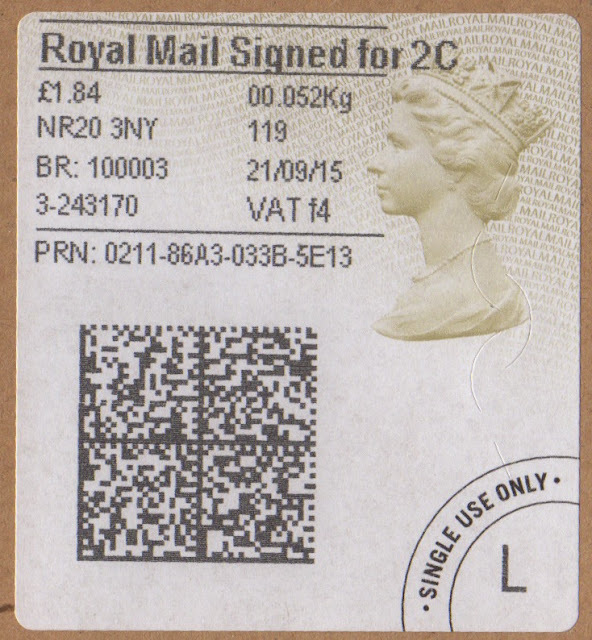 This one is - as printed at the top of the label - for Royal Mail Signed for 2C, ie 2nd class. 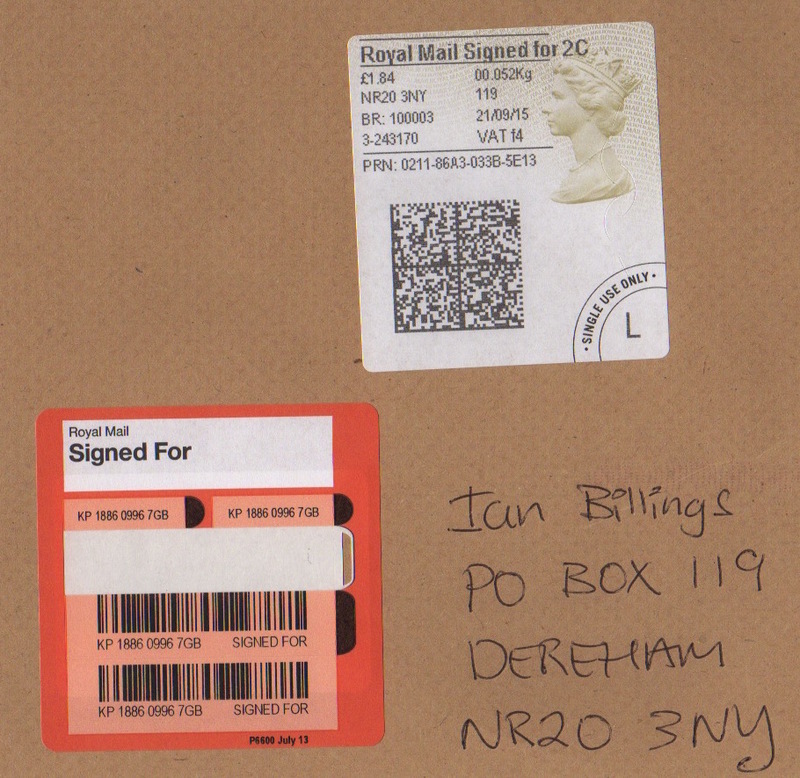 For such mailpieces the addressee postcode and house number, or in this case PO Box number, is entered into the Post Office Horizon system. As you can see this detail is also printed on to the new label. 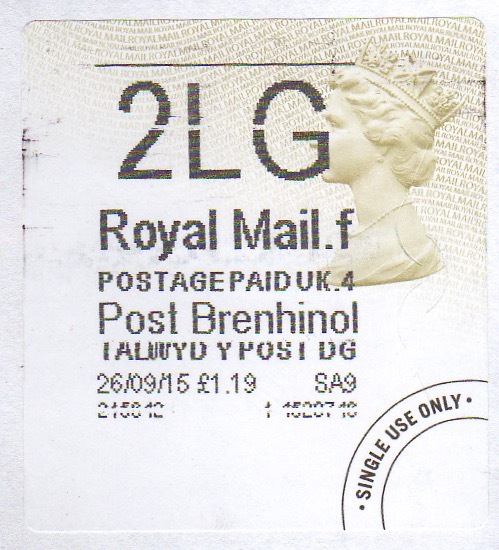 The postcode of the sending post office has gone, and at the lower right, the L indicates a Large Letter. Keep your eyes peeled for other variants! DP has pointed out that the new labels have the die-cut slits only on the right-hand side, clearly visible in the large picture above. That must save money I suppose, with the added benefit that the printing is now clear of the cuts as well. Faster than a speeding bullet, JE has supplied a picture of a non-premium service label sent from Farringdon PO on the same day. Two things to note: (a) inscription totally unchanged, so (b) the L for Large is not present at the lower right. This could obviously go on and on, and vary as more offices move to the new system. First, though, an example of the new label from Wales: now we need a tracked one with the new print format so that we can see how the Welsh inscription is changed. 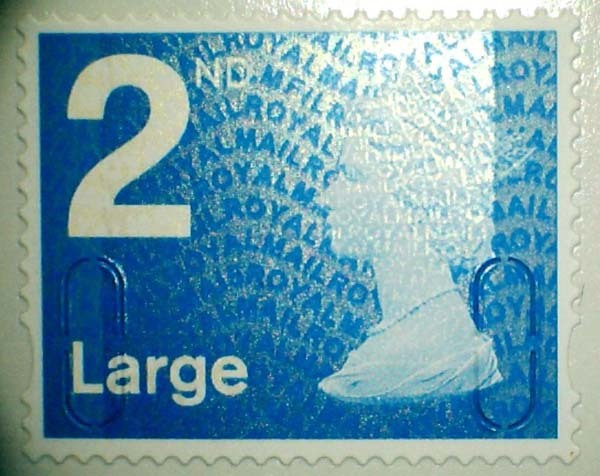 As mentioned earlier, the start of the 2015 Rugby World Cup competiton - and the issue of a set of stamps - was marked by a Royal Mail slogan postmark. This was preceded by the National Letter Writing Week slogan, and followed closely by one marking the Greeting Card Association’s Thinking of You Week. · The Rugby World Cup postmark was uploaded to the machines on 17th September so that the postmark was on mail delivered on 18th and 19th. 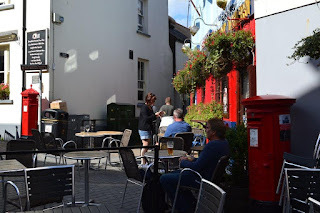 · Thinking of You was uploaded on 18th so that the postmark is on mail and delivered from Monday 21st to Thursday 24th September. Fortunately collectors are getting used to new postmarks for new stamps and are ready with covers to post for the day of issue. 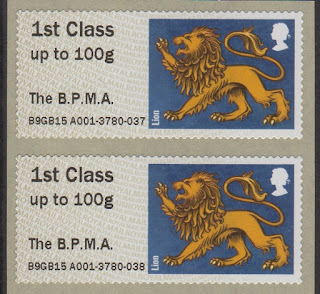 Here are the Medway Mail Centre iLSM and Preston Mail Centre IMP examples, the latter on a 1st class Rugby stamp (thanks to JE for both of these). Also one from RW from Exeter Mail Centre, with a cds as well. The first copy of the Thinking of You Week slogan comes from Croydon Mail Centre courtesy of BM. Although this and the National Letter Writing Week slogans are obviously intended to encourage use of stamps, it's unfortunate that the new stamp issue slogan, also promoting one of the year's biggest sporting events,was squeezed into two days before slogans with a commercial bent. Perhaps Royal Mail are once again taking payment for promotional slogans as they did for so long. 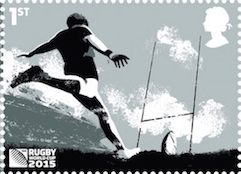 I mentioned earlier the slogan postmark for the Rugby World Cup which starts later this week. However my Royal Mail contact didn't mention that this week is National Letter Writing Week - which has also been publicised with a slogan. The only drawback I can see to this excellent idea is that people who don't write stamped letters generally don't receive any, so they won't see the slogan exhorting them to write more! As usual the slogan appears in two forms from different mail centres. Use appears to have started on Friday 11 September on 2nd class mail. 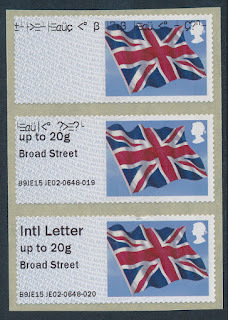 Examples from other locations will be gratefully received for the British Postmark Database and for the British Postmark Society's records. Thanks! 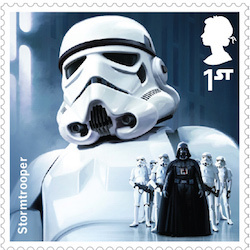 The Force Awakens -- and brings you Star Wars stamps on 20 October 2015. At long last we can plug the gap in this year's stamp programme and tell you that on October 20th a set of special stamps and miniature sheet are to be released to celebrate Star Wars ahead of the release of the latest movie. 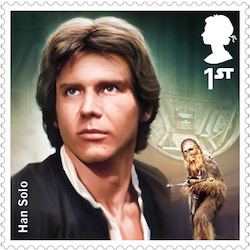 The 18 stamps will include nine iconic characters from the previous films including Luke Skywalker, Han Solo, Princess Leia and Darth Vader. 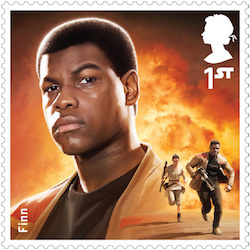 Three characters from the seventh episode, Star Wars: The Force Awakens [Trailer], will also be featured on the stamps, which are due to be issued on October 20. The font used to indicate the value, for example '1st', will replicate that of the iconic typeface used for the films. 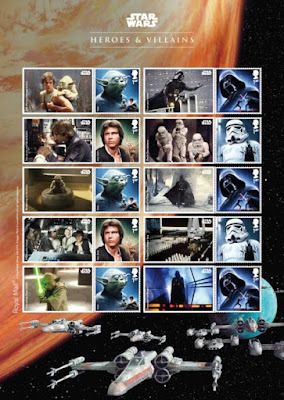 Also being issued is a miniature sheet of six stamps featuring intricately detailed illustrations of six iconic Star Wars vehicles, brought together against a backdrop of the Death Star. As we haven't had a prestige stamp book at Stampex it's possible that this issue may include one. A Prestige Stamp Book will be issued on 17 December 2015 - more details awaited. 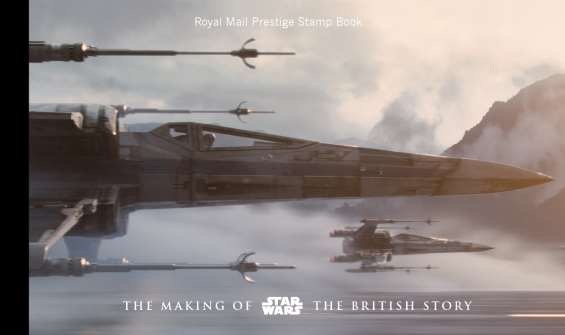 Royal Mail have provided this information which may placate some of the critics who think that this is only about supporting a US film franchise. I'm not arguing one war or another - although I do think that it is over the top in terms of quantity. The series began in 1977 and so far there have been two trilogies of movies. December 2015 will see the theatrical release of the Episode 7 - The Force Awakens, which has been filmed at Pinewood Studios, Buckinghamshire, using British expertise in cast and crew, and the two further episodes in this final trilogy will be filmed in the UK. professionalism contributed to the success of the earlier films. The new film, The Force Awakens, will reunite the three US principle actors from the original trilogy, reprising their iconic roles, as well as the robots R2-D2 and C-3PO and the alien Chewbacca. New characters will be introduced, many of which are played by British actors and include Daisy Ridley and John Boyega (both cast as leads). From the very beginning British talent has featured strongly among both the acting and production talent including David Prowse, Darth Vadar; Alec Guiness and Ewan McGregor, Obi Wan Kenobi; Anthony Daniels, C3PO; Kenny Baker, R2D2; Iain McDairmid, Emperor Palpatine; Christopher Lee, Count Doku; Peter Mayhew, Chewbacca; and many others including Liam Neeson, Peter Cushing and Terence Stamp. The British connection also extends behind the camera with world leading British talent and from Costume to Special Effects. Disney’s decision to base production in the UK is a major contributor to the British Film Industry. Not only is it providing employment and exposure for British acting talent, it also employs the British technical expertise of Pinewood studios from set design and cinematography to costume design. In the field of digital special effects, London is already a world centre, and the effects for the new Star Wars film have been created by the London office of Industrial Light and Magic (Lucasfilm’s effects company). 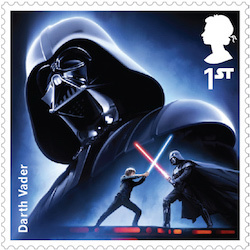 The UK is the third largest market in the world for the Star Wars films, and the new stamps both reflect the passion of the British public for the movies, and celebrate the major British contribution to the film series and the global success of the British film industry. 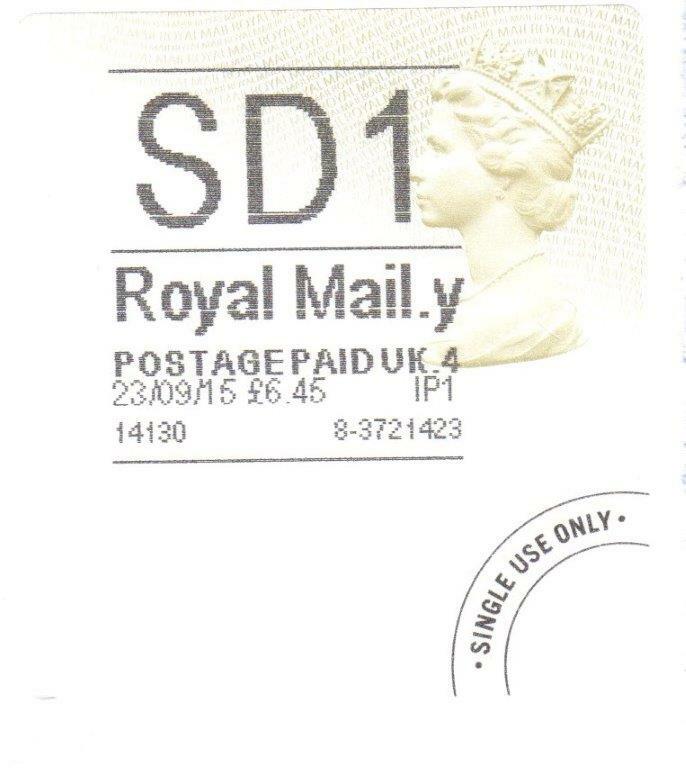 All the stamps will be shown on our website - although you can see them at the Royal Mail link above. Meanwhile here are some more images, in case their site crashes! Additional Products include a Generic Smilers Sheet. Each of the stamps also enters the Smilers programme and is available for personalisation. The Prestige Book which I anticipated but did not know about, will be issued on December 17th and cost nearly £17. More details on that when we have them. As you see from the title - The Making of Star Wars The British Story - the emphasis is very much NOT on the USA! Once again I have snippets of news from various sources so thank you to all who have sent me information and images. In most cases a larger view can be seen by clicking on the image. postmark for this most prestigious event. 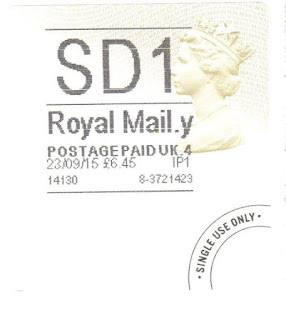 So with the stamps being issued next Friday 18 September, it is worth looking out for Royal Mail press releases and reading the small print which may well tell you that there is a postmark. If there is one I would expect it to be in use from 16th on 2nd class mail and 17th on 1st class which will be delivered on 18th. However, with the stamps being mainly black, positioning on a first day cover will need to be considered very carefully! 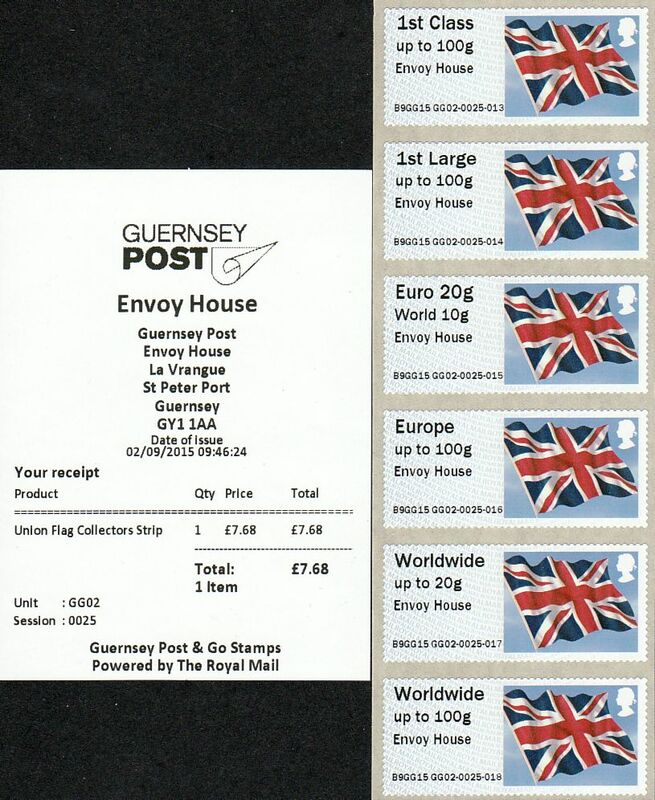 Chris has provided an image of the British Union Flag stamps and receipt from Guernsey Post's first public-access machine on the island, at Envoy House. (Click to see it larger). I think we can all be grateful that this practice has not been established in the UK by Post Office Ltd, and that Royal Mail abandoned a similar exercise for the machines in it's Enquiry Offices. 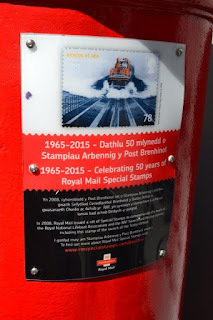 Back in July Royal Mail started affixing pictorial and descriptive plaques to 50 postboxes as reported here. Everything went quiet for a while, but Bob has noticed this one at Tenby in Prembrokeshire. Strangely the one with the Lifeboat plaque it is opposite a Victorian box, and while Bob understands that it makes sense to put it on the newer box (the Victorian one might be 'listed') he has no explanation for having two boxes in such close proximity. Collections from the Victorian one are 9am weekdays, 7am Saturdays, while the other is 5pm/12 noon! 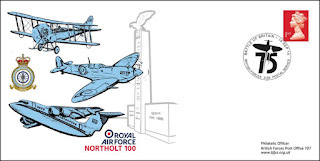 To mark the 75th anniversary of the Battle of Britain RAF Northolt has commissioned BFPS to produce the third commemorative cover in a set of three. This will be issued on the 15th September 2015. This splendid cover bears images by Flt Lt James Payne RAF, of a Royal Flying Corps B.E.2 Bi-plane, a Spitfire fighter and a BAe 146 aircraft. In the background is shown the Polish Memorial situated near RAF Northolt. 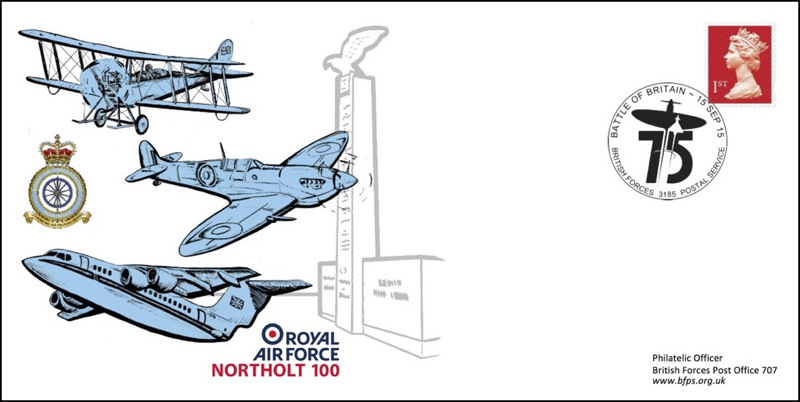 This issue will include a limited edition of 200 flown covers, some of which will be signed by the Station Commander and Officer Commanding 32 (The Royal) Squadron. The covers can be purchased from the BFPS online shop (www.bfps.org.uk/shop). These will cost just £6 (UK/BFPO p&p free) for the unsigned version, £8 for the flown only and £12 for the signed versions. "Royal Mail intends to extend the sale period of First Day Covers from one day to 3 months, initially as a trial with effect from the Long To Reign Over US issue in September. The FDCs sold after issue date will of course be pre-prepared non personalised FDCs. 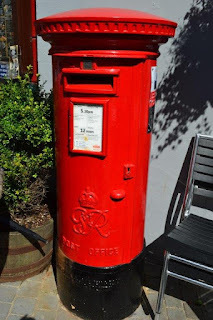 "Due to the very short sales period Royal Mail has never promoted its FDCs or Cover collecting within its promotional materials or Press activity. Only ‘First’ which goes to Regular Order FDC collectors includes any reference to FDCs. "We would like to promote the concept of Cover collecting much more widely. This development will allow us to offer finished FDCs in Post Offices and ensure they are on display in cabinets. Retailing a finished product will take FDCs more mainstream and is expected to attract souvenir and impulse buyers." The first of these is available on the Royal Mail website. The price, as with all serviced FDCs, includes VAT. It is described as the Long To Reign Over Us Stamp Sheet Souvenir. That's fine, but in the write-up a distinction is draw: "unlike the First Day Cover, it does not feature personalised address details". Quite what it is (a souvenir) if it is not a First Day Cover, and how they are hoping to promote FDC collecting if they describe this new product as something else, I'm not quite sure. Marketing people again, I expect. Not many left to be discovered now, although some of the booklets are difficult to find supplies of. The 2nd class Large booklets with year code MA15 have been found, but so far only one pack of 25. This is Norvic 2933.5 and will be added to our next Checklist which will be made available very soon. Thanks to MD for the image, even though you can't supply me with any stock! 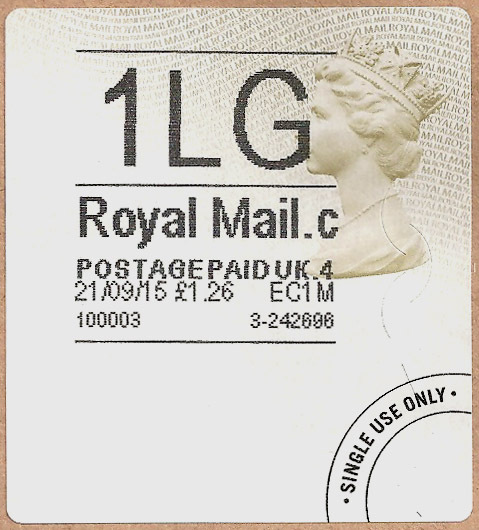 Full details of the Royal Mail miniature sheet, stamp booklet, and new definitive are now shown on our website. The year code below The Queen's chin, shows O15R instead of OVER. 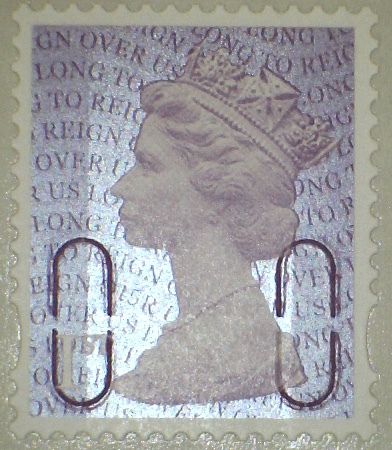 The source code on the Counter Sheet stamps, to the right of The Queen's hair, shows (REI) GN. Unfortunately this position coincides with the security cuts in the self-adhesive stamps. 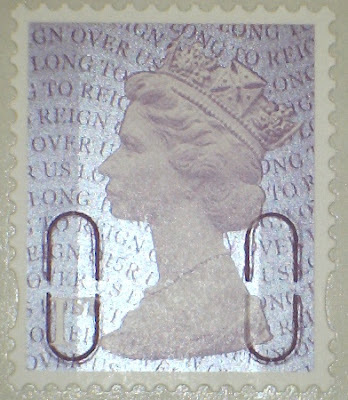 The source code on the 6 x 1st booklet stamp, to the right of The Queen's hair, shows GS instead of GN, following the principles established with the 1st class gold and red. The source code on the miniature sheet stamp, to the right of The Queen's hair, shows GM instead of GN. 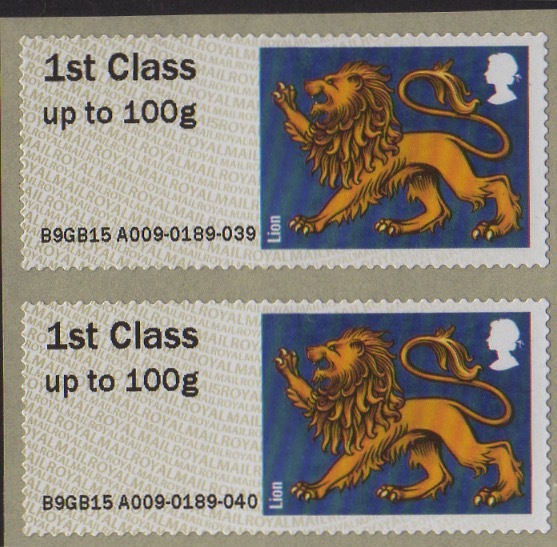 Mixed Content Retail Booklet of 6 x 1st class stamps. The first of these will be for the Rugby World Cup, and will be issued on 18 September 2015. We don't yet have these, but would expect the source code to be (REI) GC. But we have been told that there are no plans for a 12 x 1st booklet (which is good, considering the proliferation of M14L codes still in PO branches, with spring 2015 packing dates, and the absence of M15L codes on the red MTILs!) We have also been told that the change will not apply to Business Sheets nor to Large Letter stamps in any form. But that could all change in the next year! Several people have sent examples of the slogan postmark in use to publicise this issue, and their own first day covers. Many thanks to Chris, Robert, and Dominic.